How many times have you heard the phrase “Breakfast is the most important meal of the day.”? A lot, I bet. It really is true. After sleeping all night, our body and brain needs fuel. It’s even more important for kids. We send them off to school (unless you homeschool) each morning to be educated, but they can’t be full ready to learn and retain information at their best, if they’re hungry. I know it’s my job to see that my son is ready to learn. He has to start his day off on the right foot. And there is no better way to do that than with a nutritious breakfast. I do know that many kids don’t eat breakfast in the mornings, for various reasons — one reason is economics. Many families struggle to put food on the table. I remember when I was young one of our neighbor’s kids coming to our home to eat breakfast. Their Mom left really early for work and their dad didn’t/couldn’t/wouldn’t fix them breakfast. I have fond memories of my Mom making sure those two little boys had breakfast. I will admit that on school days my son wants to sleep as late as he can, so he doesn’t get a home cooked breakfast, but I do make sure he has cereal, poptarts, yogurt, and cereal bars readily available for him. 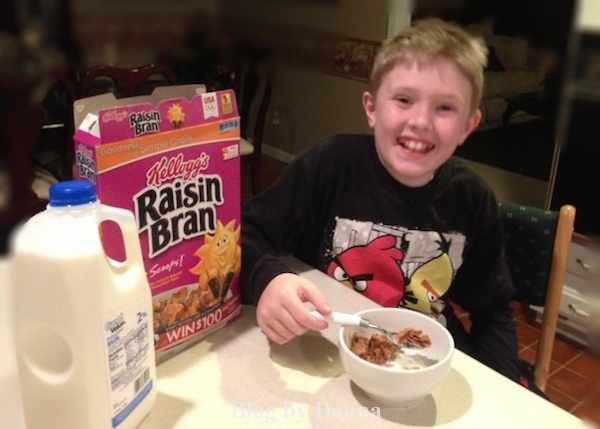 More often than not, it is breakfast on the go on school mornings… but he does have breakfast. I’m thinking about inviting some of his friends over for a community breakfast — a way of spreading the importance of breakfast. Fortunately, I know that all his friend’s parents provide them breakfast, but like with my son, that have to be reminded the importance of eating a breakfast each morning. Thanks to Kellogg’s Share Breakfast program, a lot of children that would have otherwise not had breakfast will now have that essential meal of the day. I’m proud to join celebrity and Dad, Taye Diggs, in sharing with the world how important it is for every child to reach their full potential by starting their days off with breakfast. Share the public service announcement with your friends. Share your “share” on Facebook. Sharing and repinning on Pinterest. Each of the above items will feed a child breakfast. I shared, tweeted, pinned… will you? Visit Kellogg’s “Share Breakfast” website to learn more. Driven to enrich and delight the world through foods and brands that matter, Kellogg Company (NYSE: K) is the world’s leading producer of cereal, second largest producer of cookies and crackers and – through the May 2012 acquisition of the iconic Pringles® business – the world’s second largest savory snacks company. In addition, Kellogg is a leading producer of frozen foods. Every day, our well-loved brands – produced in 18 countries and marketed in more than 180 countries – nourish families so they can flourish and thrive. With 2011 sales of more than $13 billion, these brands include Cheez-It®, Coco Pops®, Corn Flakes®, Eggo®, Frosted Flakes®, Kashi®, Keebler®, Kellogg’s®, Mini-Wheats®, Pop-Tarts®, Pringles®, Rice Krispies®, Special K®, and many more. To learn more about Kellogg Company, including our corporate responsibility initiatives and rich heritage, please visit www.kelloggcompany.com. Action for Healthy Kids® (AFHK) fights childhood obesity, undernourishment and physical inactivity by helping schools become healthier places so kids can live healthier lives. AFHK partners with a legion of dedicated volunteers – teachers, students, moms, dads, school wellness experts and more – from within the ranks of their 34,000+ constituency to create healthful school changes. After all, everyone has a part to play in ending the nation’s childhood obesity epidemic. AFHK’s programs, tools and resources make it possible so that many people can. AFHK’s grassroots efforts are supported by a collaboration of more than 70 organizations, corporations and government agencies. Working together, they’re giving kids the keys to health and academic success by meeting them where they are – in the classroom, in the cafeteria and on the playground – with fun physical activity and nutrition lessons and changes that make it possible for them to eat nutritiously and play every day. More information is available at www.ActionforHealthyKids.org, on Facebook at http://www.facebook.com/pages/Action-for-Healthy-Kids/267076500068?ref=mf and on Twitter at https://twitter.com/Act4HlthyKids. I make sure my kids go to school every morning with breakfast in their bellies before the bell rings. It saddens me to think if kids going to school hungry. My son’s favorite meal of the day is Breakfast, with oatmeal being his favorite breakfast choice. I make sure my kids always have a substantial, healthy option for breakfast each day. My kids love breakfast. It’s their favorite meal of the day! This is a great program, I hope that more like it start up, our children need us. Nice article. It breaks my heart that for some children, the only real meal they get is the free/reduced lunch at school. They’ve been doing this for a long time now so clearly it’s having an effect! My husband often skips breakfast. I don’t know how he does it. I cannot go without it, and I make sure my son doesn’t skip it. As an educator I know how important that meal truly is. This is great but I do struggle.I hate when they are outta school cause I have to strecth even farther to get them 3 meals to eat a day.But right now I aint gonna lie I rely on the school to give them breakfast and lunch. This is a great program! I remember when I was in elementary school my bus driver carried a jar of peanut butter in the bus for kids who didn’t get breakfast could at least have a spoonful of peanut butter in the morning. Breakfast is always a must in our home, that goes for all five of us! Love this program too! I’m actually doing it – it’s pretty important. I like the instant breakfast. I’m not a big eater so it’s perfect. Great program! I shared a tweet with my audience. Both my son and I aren’t too big of breakfast eaters. I need to get him in the habit before he goes to school all day! This is a great program, I know there are a lot of children in our area that could benefit from this.